(l-r) Nicki Minaj attends the Oscar De La Renta front Row during New York Fashion Week on Sept. 11, 2018 in New York City; Tracy Chapman attends the Beverly Hills Bar Association’s Entertainment Lawyer of the Year Dinner on April 16, 2014 in Beverly Hills, California. 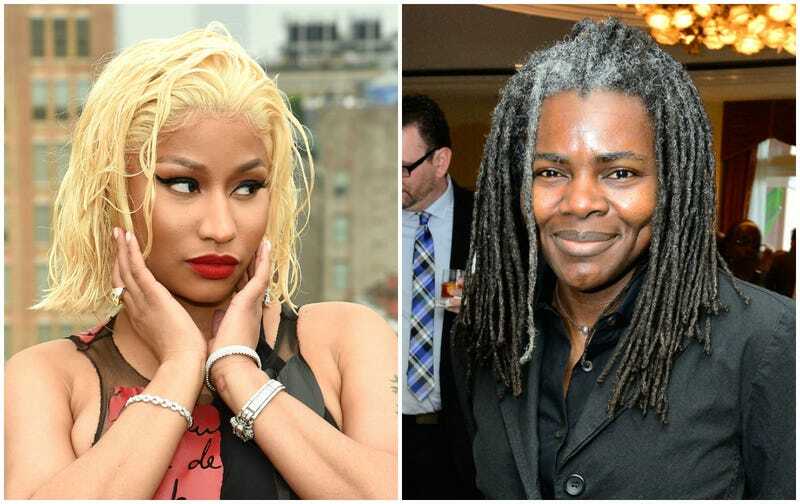 I guess it’s safe to say Tracy Chapman isn’t a Nicki Minaj fan. According to TMZ, the multiple Grammy award-winning singer-songwriter is suing the “Barbie Dreamz” rapper, alleging that Minaj illegally used the song “Baby, Can I Hold You (Tonight)” for her unreleased single, “Sorry,” featuring Nas. The ongoing saga started in June of this year, when multiple requests were made by Minaj and her team to license Chapman’s song, which was a hit single from her 1988 eponymous debut album. Chapman denied all requests. That seemed to be the end of it—until the single was played in August by Hot 97’s DJ Funkmaster Flex and on Power 105.1’s “The Breakfast Club,” after which it continued to be reposted by fans. In Minaj’s defense, or at least the one being used by her attorneys, the day the track debuted on the radio, she purportedly tweeted, “Sis said no,” ostensibly referring to Chapman’s refusal to grant her licensing rights. The song never made it onto Queen, which Minaj reportedly delayed in hopes Chapman would clear the usage. But the question remains: how did the song make it into the hands of radio DJs, and what was the endgame? It’s worth noting that “Baby Can I Hold You” has been covered in the past—multiple times, in fact, predominantly by reggae artists. Perhaps this is the reason Chapman was reluctant to allow it to be sampled (or, maybe she’s just not that into Minaj). Regardless, she’s suing for an order prohibiting any further release of the song by Minaj—and, of course, some coins for the unauthorized usage.